i. In order to replace Industrial gases like Dissolved Acetylene, LPG, BMCG and Furnace Oil /High Speed Diesel (HSD) oil with environment friendly Natural Gas, Indian Railways has signed a MoU with GAIL (India) Limited, to provide infrastructure facilities for supply of Natural Gas to Indian Railways Workshops, Production Units and Depots at Rail Bhavan. · Ashwani Lohani is the present Chairman of Indian Railways. · Nitin Jairam Gadkari is the Minister of Road Transport and Highways and Minister of Shipping. i. To promote a culture of innovation and research in higher education, the human resource development (HRD) ministry launched the Atal Ranking of Institutions on Innovation Achievements (ARIIA), Union minister Prakash Javadekar announced. ii. Named after former Prime Minister Atal Bihari Vajpayee, the ARIIA "will rank educational institutions for innovation output based on all major indicators and parameters used globally". · ASEAN stands for Association of Southeast Asian Nations. · ASEAN is amongst the fastest growing markets in the world and presents substantial trade and investments opportunities for India. · ASEAN has emerged as the second largest trade partner of India in 2017-18 with bilateral trade valued at US$ 81.33 billion, comprising 10.58% of India’s total trade with the world. i. Balesh Sharma takes over as Vodafone Idea's first CEO. He was the Chief Operating Officer of Vodafone India and a member of its executive committee. i. India won gold in the women's 4X400 metre event. ii. The Indian quartet of Hima Das, Raju Poovamma, Saritaben Laxmanbhai Gayakwad and Vismaya Koroth registered a time of 3 minutes and 28.72 seconds to finish at the top of the podium. 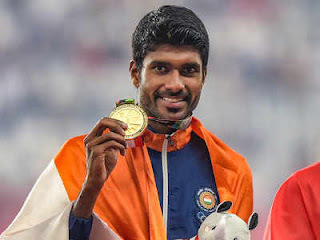 India clinched the silver medal in the men's 4X400 metre event.